Kelly Houtappels-Bruder, an Ontario native currently residing in Steensel, NED, cracked the top 10 at the FEI World Driving and Para-Driving Championships for Singles, held Aug. 28-Sept. 2, 2018, in Kronenberg, NED. Piloting her trusted partner, H. Hoogers’ 10-year-old Oldenburg gelding, Flip (Fidertanz x Carprilli), Houtappels-Bruder started strong with a score of 51.69 penalties in the dressage phase on Aug. 31. In the marathon phase the next day, she and Flip added 94.43 penalties to their total. Houtappels-Bruder ended on Sept. 2 with 6.00 penalties in the cones phase, finishing on a final score of 152.12 penalties for ninth place overall. Top honours went to Poland’s Bartlomiej Kwiatek and Sonet on a final score of 139.27 penalties. Fellow Canadian, Pierre Guillemette of Becancour, QC made his first world championship appearance, completing the challenging three-day event with Tjibbe, a 14-year-old gelding owned by Koos de Ronde. 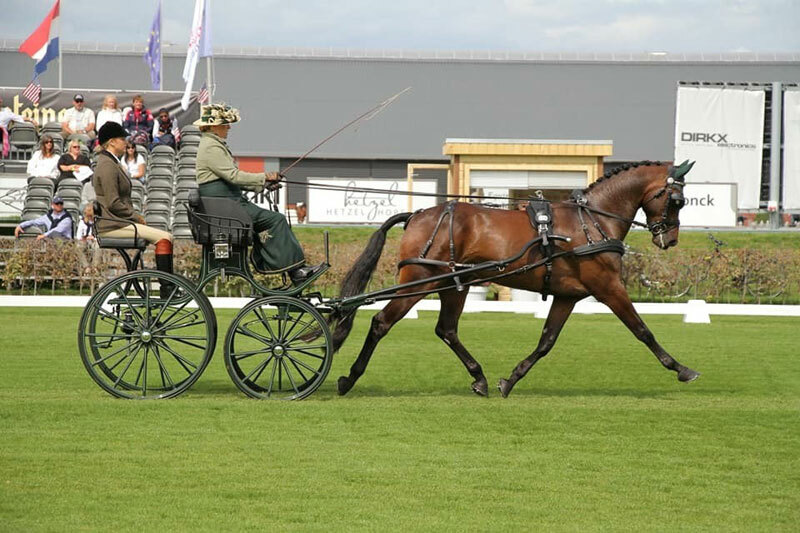 For full results from the FEI World Driving and Para-Driving Championships for Singles, click here.